I receive a lot of questions regarding the types of paint I use in my work. It’s not outwardly apparent in most cases (which is what I strive for; I want my work to be about the colors and rhythm and not it’s materiality), so thought I’d put together a little information on how to make and use thinned acrylics like mine. What I’m searching for is pigment without texture, color made from layering pigment, and preserving the natural randomness of water. I began with watercolors, building washes and layering on paper, but when I started to expand the dimensions of my paintings and wanted to work with ever-so-slightly more opaque paints I switched to thinned acrylics. I know there are a number of other ways to approach this technique - I’m just going to detail mine here. If you have another method, please feel free to share with us in the comments! 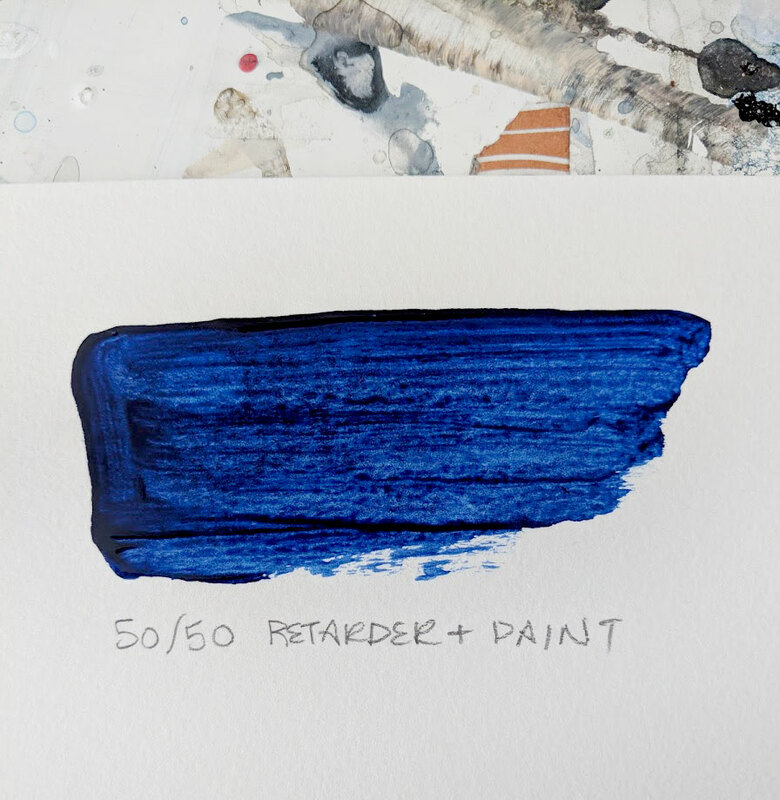 The paints I work with would generally be considered a “wash.” A wash is when you add 60% (or in my case - more) water to the pigment. My washes are generally more than 60% water to pigment. I use golden acrylics and thin with water according to the colors/movement I am aiming to create in the final painting. If a lesser quality of paint is used, no amount of vigorous shaking will force all the particles into the fluid - there will be chunks. I say that as a heads up - it took me a few very sore arms to realize that some paint just wants to be, needs to be solid. I still use these paints but in other situations where their consistency is required. 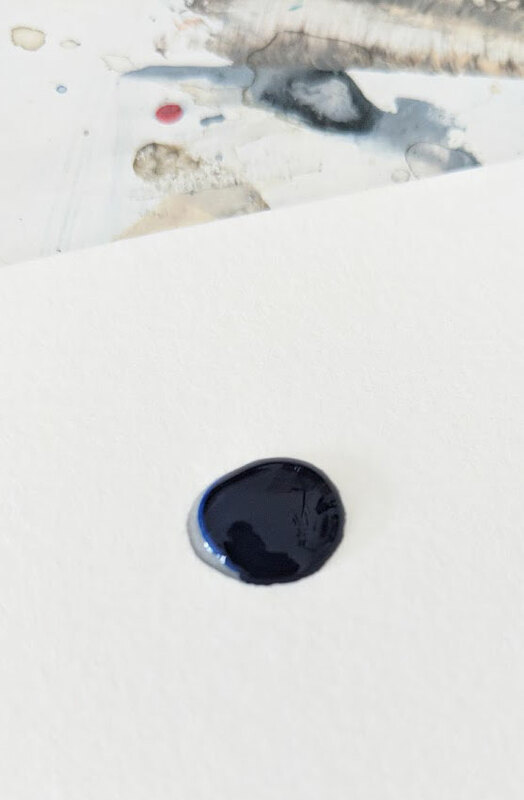 The top swatch is 50% water with 50% paint. Middle swatch is 60% water to 40% paint. Bottom swatch is 80% water, 20% pigment. I mix these three ratios of paint in three jars. With a jar of clean water on hand, I sketch the forms on the canvas or paper with the lightest wash (80/20). I'll build layers with this until I require a bit more depth and then I switch to the middle hue. When the forms are fully realized and the painting is nearly done, I'll go back in with the 50/50 mix and add the final pools. Various mediums can also be added to the paint, creating a “glaze.” Glazes are made when you add 60% (or more) medium to the pigment. Glazing fluids have the same adhesion that acrylic paints have, just without the color. When added to acrylic paint they don’t preserve the texture of a brush and can be mixed in without having a significant effect on drying time. To create thin paints without a lot of running colors (mural work, canvases on the easel) glazing fluids are a good bet. Just make sure to read the mixing directions on the bottle as ratios vary by brand. Retarders are used to increase the drying time of acrylic paints. I spent a fair amount of time painting in oils and got very, very used to the slow drying times. Mixing a retarder with acrylics not only thins the paint, but allows for the wet-on-wet techniques that you might find with oils. Be careful when adding retarders to ONLY thin however - as too much will give your painting a drying time of multiple days (or more!). Again - make sure to follow the directions on the bottle, most retarders do not recommend more than a 1:1 ratio. Acrylic always dries darker, watercolor always dries lighter. When working with thinned paints that rule still holds true. When mixing acrylics with colors before thinning - it’s important to remember that the deeper colors will come through as it dries. The most beautiful pale pink can easily shift to a ruddy rose in a few hours. Again, experimentation is key! Working with thinned acrylics is all about personal preference and desired outcome…. paint by numbers doesn’t work so well here. Experimentation is the most important thing; finding a pool of paint that resonates in your soul and that you respond to is the key to working with the medium. Don’t panic if it doesn’t happen right away, just keep playing with the paint until your creative soul finds it’s home.